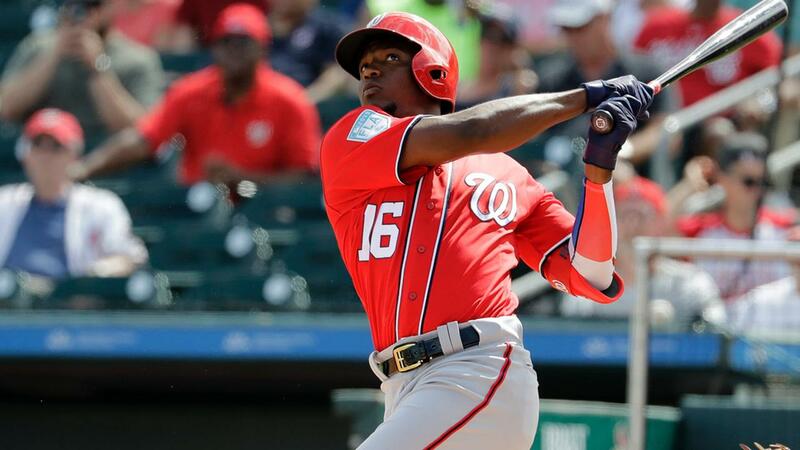 Victor Robles isn't letting up in his quest to earn an outfield job by Opening Day. The top Nationals prospect went 2-for-4 with a long home run to help Washington past Minnesota, 10-4, in Fort Myers on Thursday. Robles slugged his second homer of the spring in the second inning, knocking home Spencer Kieboom as Washington took a 5-0 lead. MLB.com's No. 4 overall prospect, who is batting .375 in Spring Training, began the game with a line-drive single to center field and scored on Jake Noll's two-run double. Robles went 1-for-2 with a pair of walks, a run and two stolen bases Wednesday and could be in line to take the Nats' primary center-field job. He's expected to shift to right at times -- as he did Thursday -- when Michael Taylor gets penciled in at center. "We've got four really good outfielders," Nationals manager Dave Martinez told MLB.com on Tuesday. "I think they're all going to play. Victor's going to play because he's young and we've actually got to see what he can do. But Michael's just as important as anyone, and I want to get him playing time." Tanner Rainey, Washington's No. 19 prospect, allowed a run on two hits in one inning and No. 30 Kyle McGowin worked around two walks in one frame. Twins No. 5 prospect Trevor Larnach went 1-for-2 with a solo homer.